The Brighton Beach cycle path is now complete. 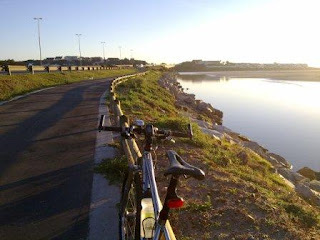 This effectively creates a cycle path from the Papenkuils River mouth (Smelly Creek) through to the Zwartkops river. The last bit of pathway was laid approximately 2 weeks ago. You can view my route to work which incorporates the bike path. The path continues across the Zwartkops through to the Coega IDZ.